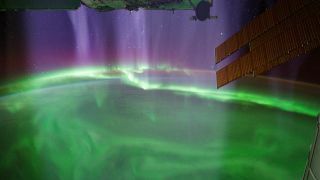 Visualization of charged particles streaming down onto the atmosphere, creating a stunning aurora as viewed from the International Space Station, as seen in "Earth From Space," a PBS documentary produced by NOVA. Seeing the Earth from outer space gives people flying above the planet a new perspective, and no one knows that better than Piers Sellers, a former NASA astronaut who flew three space shuttle missions to the International Space Station. A new NOVA documentary premiering on PBS Wednesday (Feb. 13) details how satellites have changed the ways scientists like Sellers look at how the Earth works. Called "Earth from Space," the two-hour documentary uses interviews with scientists like Sellers to explain exactly how important satellites are to research today. SPACE.com spoke with Sellers about his spaceflights to the International Space Station (ISS), the NOVA documentary and the surprising new perspectives on the planet granted by Earth-orbiting satellites. How did you get involved with "Earth from Space"? Do you think it's important for non-scientists to watch the documentary? I do. I think it's the whole business of trying to understand our planet through science, and how we can use science to help us make better decisions. I think it's right on. Can satellites capture the perspective you get when you see the views from space? I'll tell you, the satellites and pictures from ISS do a pretty good job. And if you look at the NOVA segment, there are some beautiful sequences of views of Earth from ISS when you're flying over the nighttime Earth and you see the airglow and all those things. I think it captures just about 60 or 70 percent of what you actually see from space. So that's good. I think having been to space, and flown around the planet multiple times, that it did bring home how small the planet is and how fond I am of it as a place to live. Before I flew into space, I used to think about your area, your country, where you live and all the rest of it, but actually the planet is a very finite place. I'm fond of Earth. What accounts for the other 30 or 40 percent satellites can't capture? I think just the fact that it's all around you, when you're looking out of the station cupola in particular, which is like a bubble on the bottom of the station, you have the whole planet basically swirling around you. What are the "gravity missions" and why are the results from them so surprising? The way it works is there's a mission called GRACE (Gravity Recovery and Climate Experiment), and it's two satellites that fly around the world, one trailing the other. When one, the first one, goes over a little amorphous object, it dips down just a little bit, a fraction of the width of a hair, and the second satellite can see it. It's tracking it with a com-link. Then you do an analysis of all these little wiggles in the orbit, and you can figure out where the heavier and lighter objects are on the Earth's surface. And believe it or not, you can figure out how much ice there is on Antarctica and Greenland by analyzing all the data. It's almost miraculous. It is amazing. So I never saw that coming as a scientist, and I was just completely stunned when I saw the first results. I never expected that that would be doable, and to me that seems like magic. Now we've got the means to actually weigh the amount of ice on Greenland and then see how it's declining over time. Do Earth-centered observations help scientists when looking at other planets? It's funny. The two communities continually bounce off each other. The people who went to Mars originally, the probes we sent to Mars, a lot of the instruments they took for the first few expeditions were inspired and leveraged off Earth-censoring instruments. The converse is true, too. We're finding that the technology we're using to explore the other planets, some of it is being used here to study Earth. It's a symbiosis. The NOVA documentary "Earth from Space" premiers at 9 p.m., ET/8 p.m. Central, on PBS (check local listings). You can follow SPACE.com staff writer Miriam Kramer on Twitter @mirikramer. Follow SPACE.com on Twitter @Spacedotcom. We're also on Facebook & Google+.